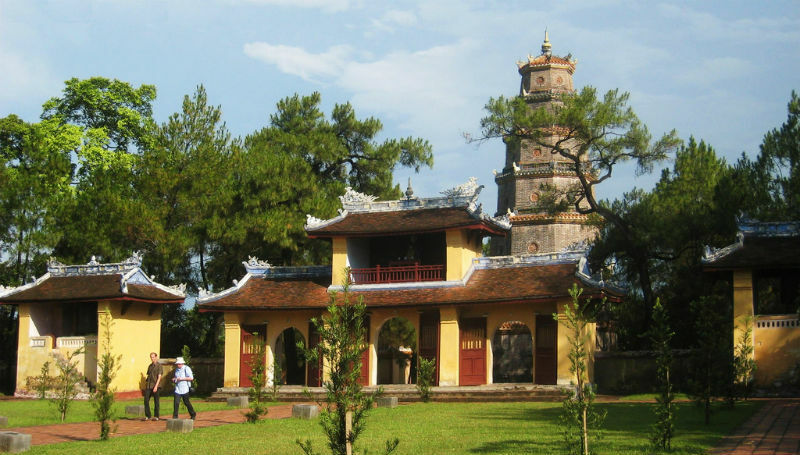 The Pagoda of the Celestial Lady or Thien Mu Pagoda is a historic temple in the city of Hue in Vietnam. 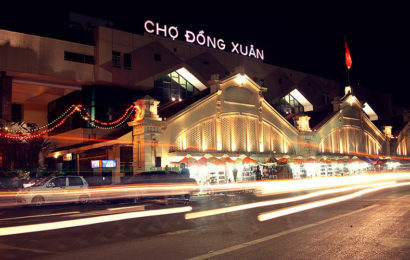 Its iconic seven-story pagoda is regarded as the unofficial symbol of the city, and the temple has often been the subject of folk rhymes and ca dao about Hue. 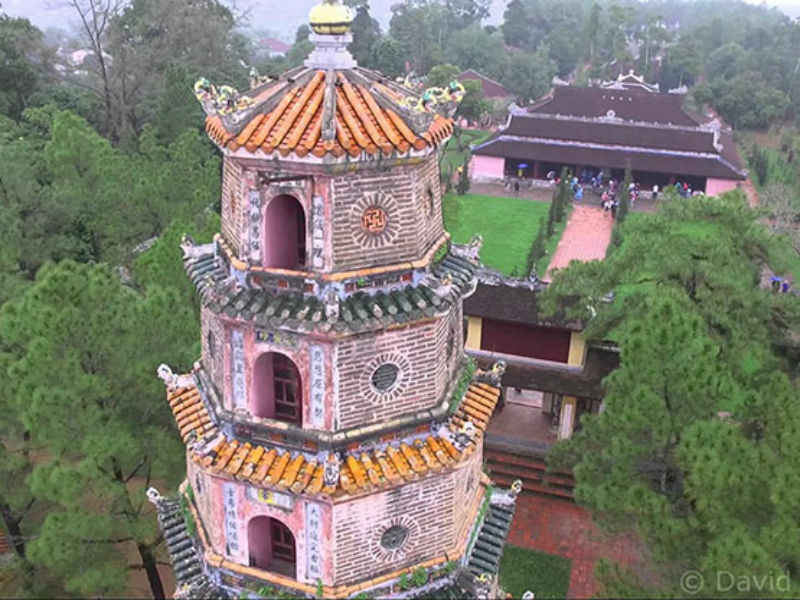 Thanks to the rise and heyday of Cochinchinese Buddhism, the pagoda had been rebuilt in a significant scale under Lord Quoc period – Nguyen Phuc Chu (1691-1725). Lord Quoc contributed a great 2-ton bell called Dai Hong Chung. The Lord then oversaw another series of major expansions and construction projects. Accordingly, the largest expansion phase in the pagoda’s history in 1714, namely Thien Vuong shrine, Dai Hung shrine, shrines to the heavenly realms, the Jade Emperors, halls for preaching Dharma, towers for storing sutras, bell towers, drum towers, meditation halls and halls to venerate Avalokiteshvara…many architectural works of which no longer exist today. Lord Quoc also personally wrote and carved into a large stele (2.60m high and 1.2m wide) talking about the construction of buildings here. The stele was placed on the back of a huge stone turtle, decorated simple but extremely breathing. 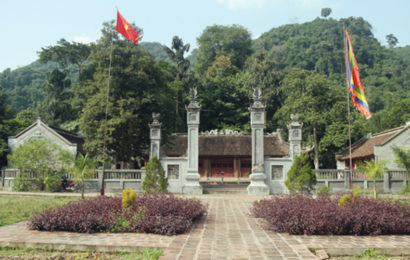 Thien Mu Pagoda ranks one of 20 beautiful spots in Hue Imperial City. Undergoing many expansion and renovation, beside architectural works as Phuoc Duyen Tower, Dai Hung shrine, Dia Tang shrine, Avalokiteshvara shrine…along with stone steles, bronze bells, Thien Mu Pagoda today is home to many precious antiques in both history and art. 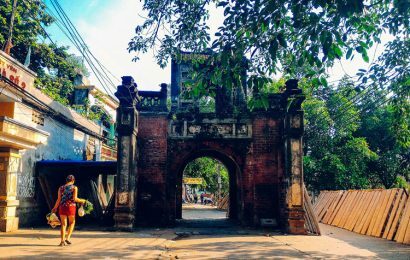 Statues of Dharmapala, Ten Kings, Buddha Maitreya… or couplets here have marked the history of the golden era of Thien Mu Pagoda. 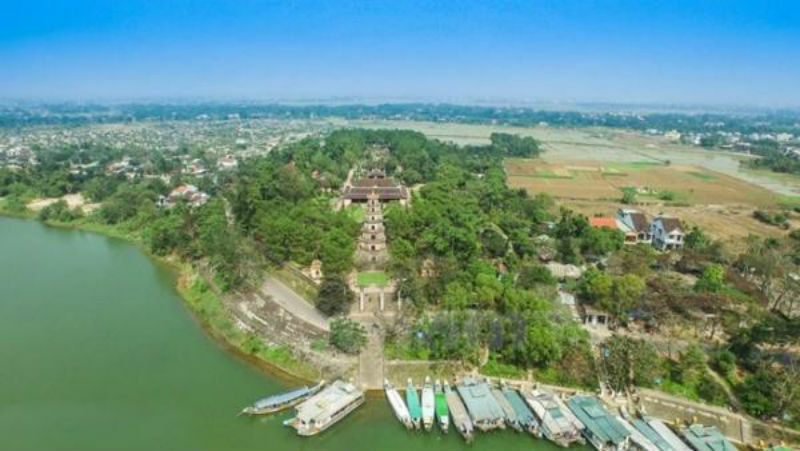 Thien Mu Pagoda is not merely a spiritual place but also a wonderful place of sightseeing, which had been placed in the most beauty rankings of Hue. Standing inside pagoda’s fences and looking the upstream, tourists will easily recognize spectacular and romantic Perfume River, which has long been a symbol of Hue. The water flow is divided by Ngoc Tran Mountain, then combines together right in front of pagoda’s entrance. Standing in the other side of the river, Phuoc Duyen tower reflects its shadow on the water face, creating romantic scenery. In particular, tourists going to dreaming Hue usually take a dragon boat trip up Perfume River to sightsee the tranquil pagoda.